In order to make the wedding celebrations even more exciting, a horse-race was arranged. After the wedding it was decided that this horse-race was to be an annual event, and that it would take place at the same time every year. Thus, the first many years, the Oktoberfest was more of a sporting event, although a fair amount of drinking and partying did take place. As time went by the event grew bigger and bigger, and eventually it was decided to push the annual dates forward, so that the weather (hopefully) would be better. Today the Oktoberfest is held from mid-September and usually 16 days onward, including the first weekend of October. Some years the German “Reunion Day” is on the first Monday of October. When that happens, the Oktoberfest is extended with an extra day. As already mentioned the event takes place at the “Theresiewiese”. Hence, the Oktoberfest is often just referred to as the “Wiesn” - the meadow. The total area is apprx. 42 acres. Wiesn is not just a beer festival. It is also one of the largest fun-fairs I have ever seen. It contains 3 VERY large roller-coasters, 3 “Free Fall Towers” and numerous ferris wheels, carrousels, children’s rides, sideshows etc etc. During daytime it is an absolute paradise for families with children. They love the sweet-stalls, the hotdogs and the ice-creams. And they love the rides. It is not all wrong when many people call this the largest “Folks-fest” in the world. Up to 150.000 times a day! 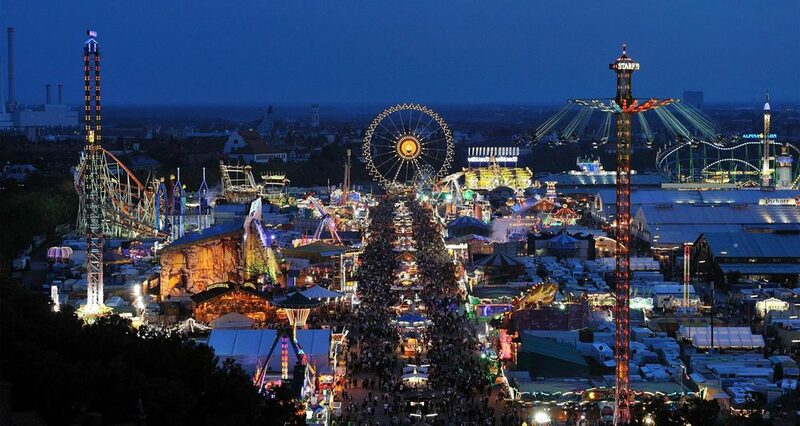 During the 16 days of the annual Wiesn/Oktoberfest it is estimated that the total revenue exceeds well over 1 billion Euros. This includes hotels, restaurants, municipal transportation etc. The event is visited by apprx 8 million guests. It takes 3 months to build a large beer-tent (which is actually a giant hall) - built in metal, wood and glass, just like many other permanent buildings. It takes apprx. 5 weeks to remove everything again. And this is the rule: NOTHING can be left behind! However, the largest of the tents do have a dispensation, that allows for them to have permanent foundations buried in the grounds. Thus they are always located at exactly the same place every year. But when the event is over and cleanups are finished, everything is buried, so that you wouldn’t know that anything was ever built there. Each tent has an average of 350-400 staff members and will seat between 8000-10.000 guests at any time. During the opening hours (12 hours a day) apprx. 40.000 guests come through each tent. 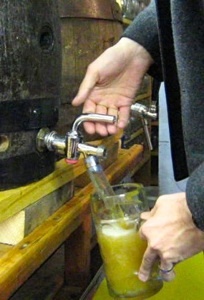 They drink a total of 100-120.000 liters of beer. PER DAY! During weekends this even goes up to 150.000 liters. Multiply this by 12 tents! EVERY DAY! Additionally there are 4 mid-sized tents serving wine, schnapps and other beverages for those not too keen on beer. The Oktoberfest is, in other words, not exactly unimportant if you look at the financial perspective. It is, by far, the biggest tourist attraction in Munich, if not Germany. And just the immediate “catchment area” is fairly large. From most of Europe the guests are coming every year. We have even seen taxi’s arrive all the way from Milan. They must be thirsty, those Italians! Well, then Prost it is! See our Oktoberfest video here! Read our Guide to Munich! Read our Guide to Germany and the Germans!